Had my first real challenge with the Beachbody Ultimate Reset today. 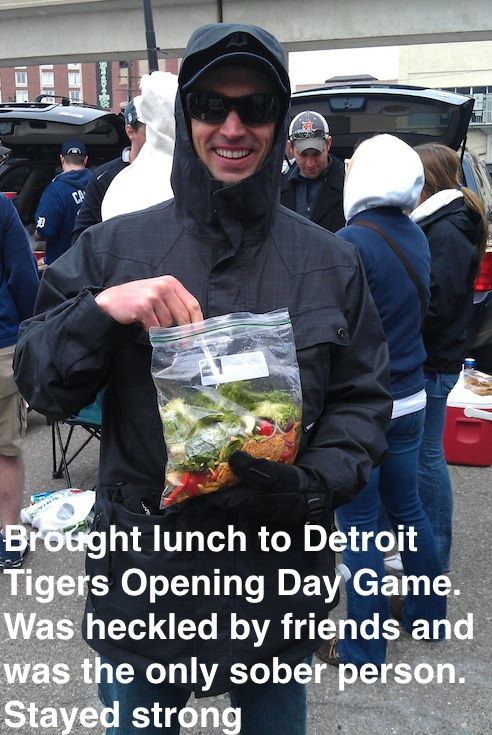 A friend offered me free tickets to the Detroit Tigers opening day game against the Boston Red Sox. You don’t turn down free tickets to Opening Day. He called me the night before and I knew I would have to prepare everything and take it to tailgate. We skipped the fancy meal they wanted you to prepare for breakfast that day and had Vegan Shakeology instead which is ok for a substitute. I made the pinto beans, rice, and micro green salad the night before and put it all into a big Ziploc bag. When it was time to eat at tailgate my friends instantly started to rip on me which was to be expected. What was funny was many of them said it looked really good, which it was. I even brought all my supplements for the day and took them before and after the game. Was proud of myself to make all of this happen along with not having any beers or buying nachos at Comerica Park which I always get. On a side note, I spent $0 the entire day where I would usually spend $50 or more at tailgate, the game, and afterwards. When we made it back home we made the Sweet Potato and Roasted Red Pepper Bisque and asparagus.